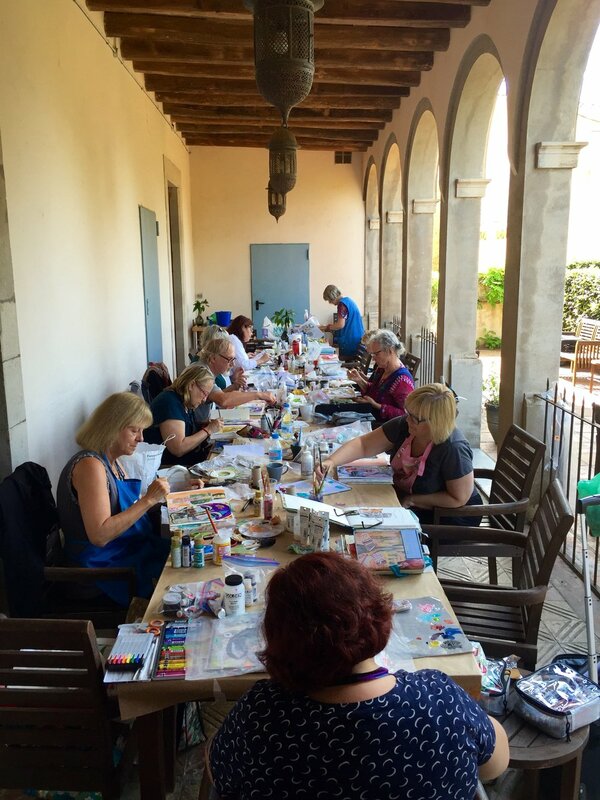 We started in Barcelona where we picked up four new artists to join us for our week at Can Tallada for Journaling with a Circle of Friends with Katie Kendrick and Judy Wise. The space was large enough that everyone had their own room and we had a wonderful place to create outside. My colleague, Amy Persons and I were the chefs that week, creating meals in a beautiful kitchen. We took two day trips to visit medieval towns where Games of Thrones have been filmed. We had a lovely lunch on the Mediterranean where we dipped our toes in the surprisingly warm water and we walked high above the coastline admiring the homes along the cliff. We visited a sheep farm where we sampled their cheeses, kiefer and olive oil. Ruben, our handsome driver demonstrating how to drink the wine with encouragement from our guide for the day, Jack. Of course, we had to pet the sheep, including a day-old baby. We visited Girona which I think we all fell in love with for its charm and shopping opportunities. We also had a fabulous meal at Cul de Mon. Returning to Barcelona, we visited the Miro Museum, Museum of Modern Art, rode a tram up to Castell de Montjuic, saw Familia Sagrada and Park Guell with Forever Barcelona (great guides!). Of course, there was a parade or two, this time for la Merce 2016. We finished our escape with a night tapas tour with Devour Barcelona with the lovely Fiona as our guide. Judy wrote about our trip here. Still can't believe we were there. Thank you artists who traveled and shared this incredible Escape with us. Missing from the picture is Heather who stayed at Can Tallada to paint for three more days, Cheryl and Laura who were off exploring on their own.